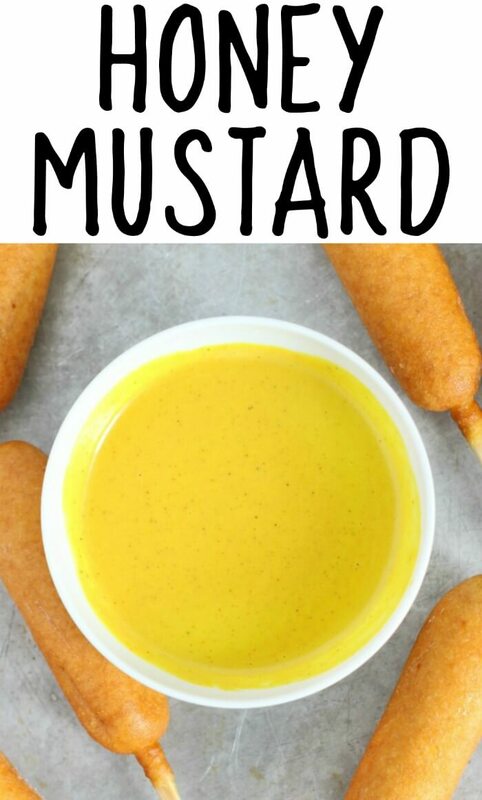 Our honey mustard recipe is the perfect quick dip for corn dogs, chicken nuggets, or drizzle it on your favorite salad or wrap! This honey mustard recipe comes together super fast and is made with ingredients you probably already have at the house! 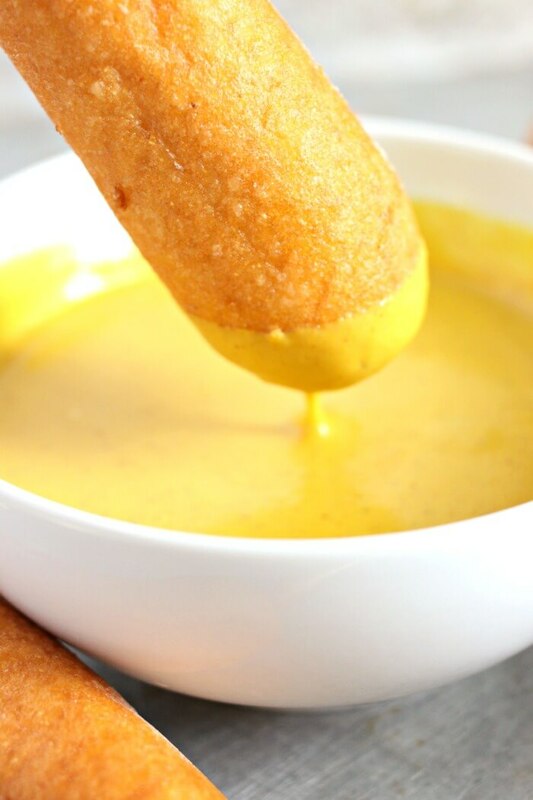 Honey mustard is perfect for dipping, dressing, and dunking. 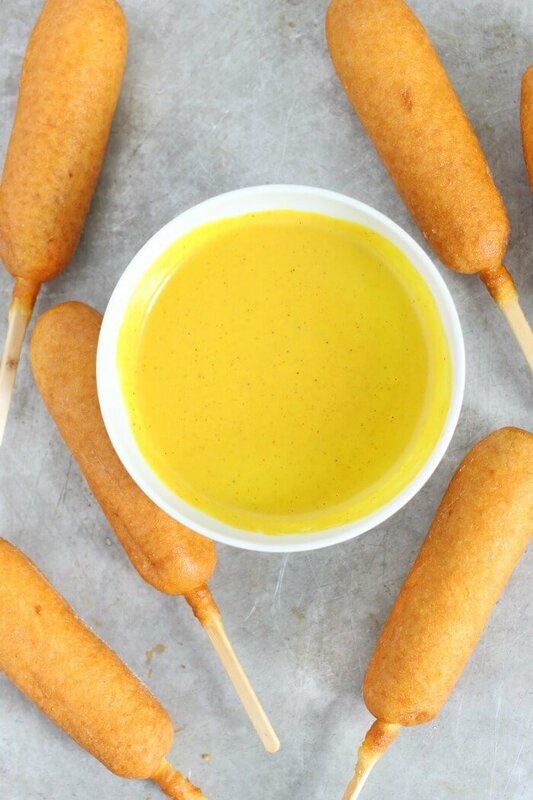 Not a fan of our honey mustard recipe – try your corn dog in one of our other delicious sauces like blue cheese dressing, cilantro garlic sauce, chimichurri, dijon barbecue sauce, or curry mustard sauce. I picked up some Foster Farms Honey Crunchy Corn Dogs from my market yesterday and was immediately surrounded by hungry children. While they were baking I decided we needed a quick dipping sauce and whipped together this simple honey mustard recipe. 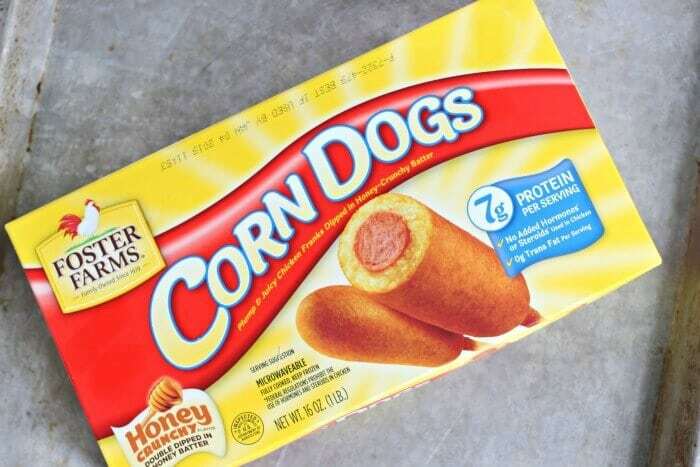 We love corn dogs as a quick lunch or snack and it’s awesome that Foster Farms has them in a 16 count box. The perfect size for my family! 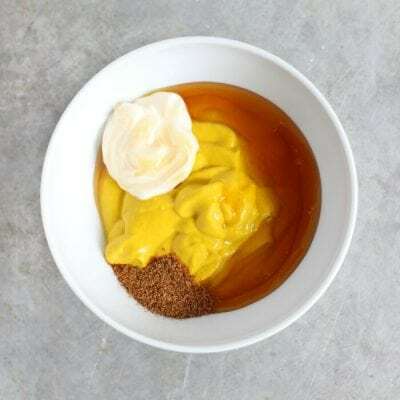 Mustard – I love a good traditional yellow mustard in this honey mustard recipe, but you could also use dijon, stone ground, or even spicy mustard. Honey – Any honey will work! I like to pick up local honeys when we travel, just a fun way to try new honeys! Mayonnaise – I’m a full fat mayo fan, but if you’re partial to another kind then go for it. You could skip the mayo, but it will lose some of the creaminess that makes this recipe great. Spices – Is a recipe even really a recipe without a dash of something. I love a good well rounded seasoned salt to finish this off. What is honey mustard made out of? Honey mustard is made out of honey and mustard. In our honey mustard recipe we also add mayonnaise for creaminess and some spices to perk up the flavors. Is honey mustard dairy free? Our honey mustard recipe is dairy free. We rely on mayonnaise for creaminess. Mayonnaise is not dairy, it is made with egg and oil. Or in some cases (fat free mayonnaise, for example), food starches. Is this honey mustard recipe gluten free? Our honey mustard recipe is also gluten free. We find that the combination of ingredients is perfectly thick enough and does not require the addition of extra starches like flour. How long you can keep homemade honey mustard depends on the individual ingredients in your honey mustard recipe. Take a look at the expiration date on each one and the earliest expiration date will be when you should toss yours. Typically in this recipe, the mayonnaise will have the earliest expiration date. Make sure to write the date on your container before putting it in the fridge! This honey mustard recipe is divine as is, but if you feel like changing things up a bit, here are a few ideas! Creamier honey mustard – double (or triple) the amount of mayonnaise. Spicy honey mustard – use a spicy mustard instead of yellow mustard. Sriracha honey mustard – everyone’s favorite rooster – stir in a teaspoon (or more!) of sriracha for a different kind of spice. Mellow honey mustard – switch to dijon instead of yellow mustard for a milder flavor. Fancy honey mustard – want to serve this at a party and look high class – try it with stone ground dijon mustard. 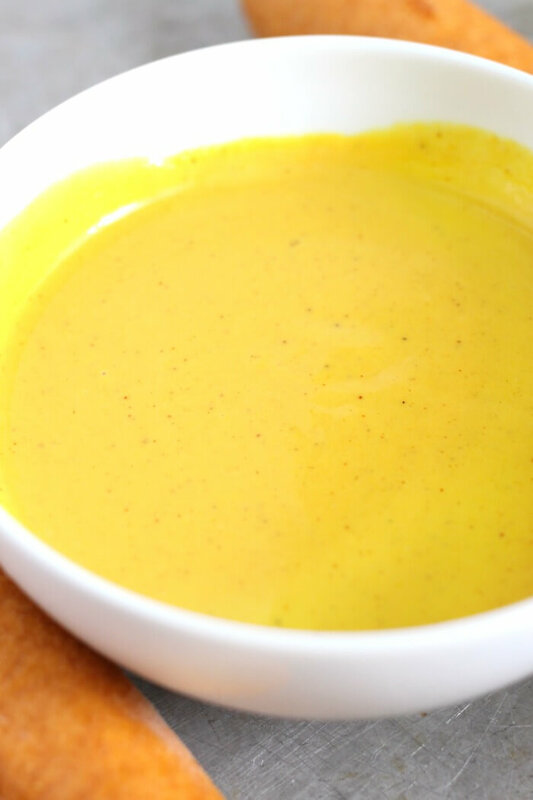 Curry honey mustard – stir in a teaspoon of your favorite yellow curry powder for an eastern kick. Yum! 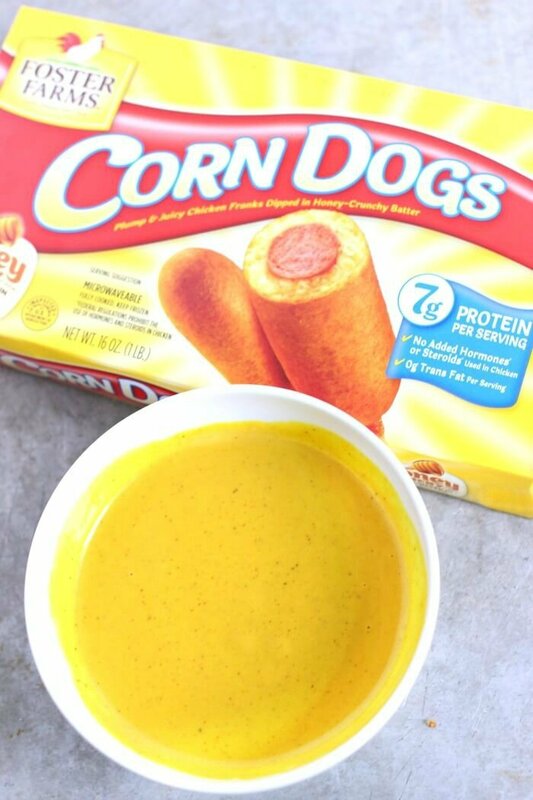 Foster Farms Honey Crunchy Corn Dogs and Foster Farms Chicken Breast Nuggets are the perfect foods to dip in our honey mustard recipes. 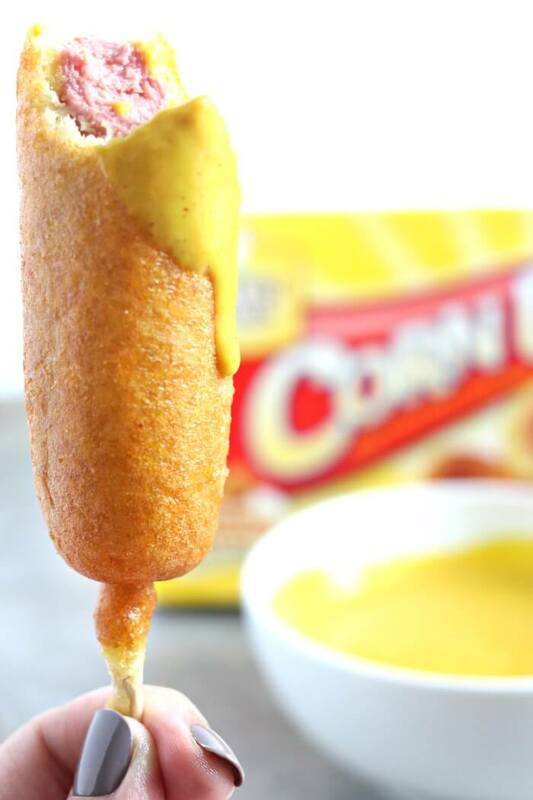 The Honey Crunchy Corn Dogs are perfect for the busy back to school season. They’re made of chicken, have no added hormones or steroids, no trans fats, and contain a whopping 7 grams of protein per serving to keep you and your kids full and fueled. I also love that they can be made in both the oven or the microwave. So my tweens can make their own! The Chicken Breast Nuggets are 100% natural with no added hormones or steroids. They are made with 100% white meat Foster Farms chicken and available in frozen chicken section of most major retailers nationwide. Foster Farms = Good Protein that is Easy and Convenient! 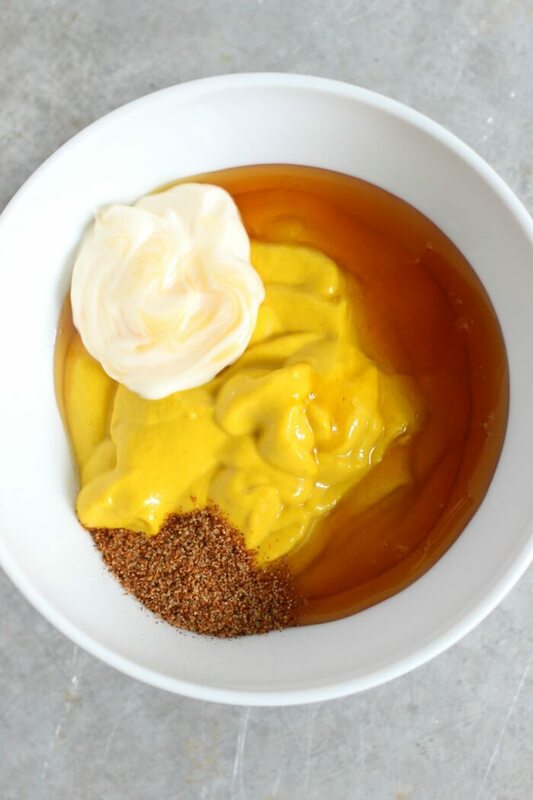 We used a medium sized bowl, a small whisk, and a rubber spatula to make this honey mustard recipe. In a pinch you could do it with a bowl and a fork but I love a rubber spatula to make sure we’re getting every little bit out of that bowl! Whisk together ingredients and enjoy! I want to dip ll the things in this yummy mustard! My daughter is a huge honey-mustard fan but I rarely but the prepared version from the store. I was so happy to see your recipe and I made a batch for the grilled chicken tenders we served up last night and the sauce was perfect! I will always have a jar of this sauce in my fridge – it’s delicious! I’m so glad you loved our honey mustard recipe!!! 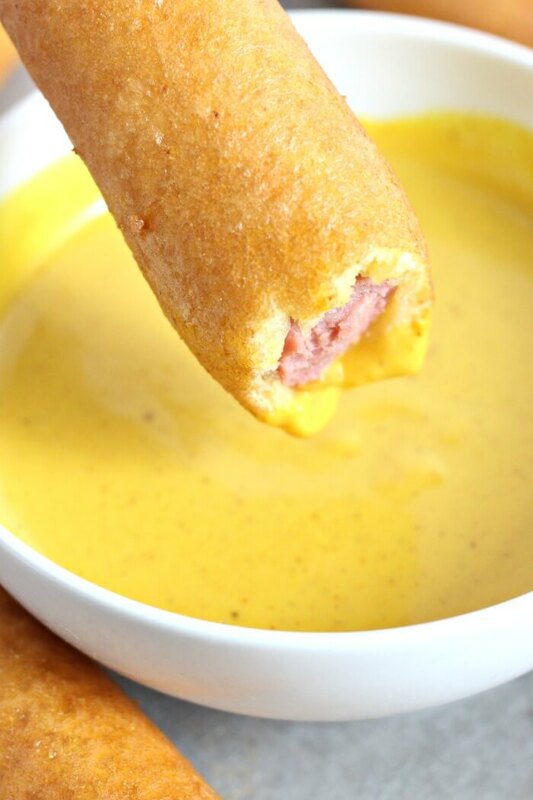 Corn dogs are my comfort food, it’s nice to find an easy and delicious sauce to make with them! I used avocado mayo & Dijon, it was delicious with this, thanks for sharing!